Meatless Monday’s, have you heard of them? Yep, we’ve jumped on the meatless Monday bandwagon too. Seasonal vegetables are incredibly versatile and can be enjoyed so many ways. 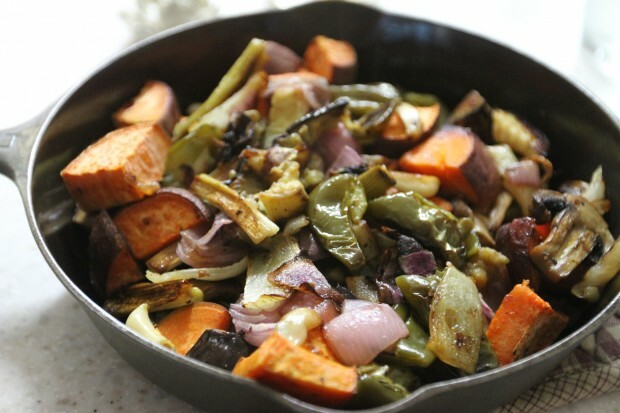 Lately we’ve loved slicing up leeks, yams or sweet potatoes, garlic, mushrooms, carrots, red onions, green peppers and roasting them. Sometimes we even throw in a meat replacement such as Gardein beef tips, or sauté the vegetables in a chili oil before roasting. Truly a dish that I could eat over and over again. Oops.. this is embarrassing, we ate the soup before taking a photo to share with you all. I’ve mentioned this before, I am lactose intolerant and I tend to mind cream based soups. 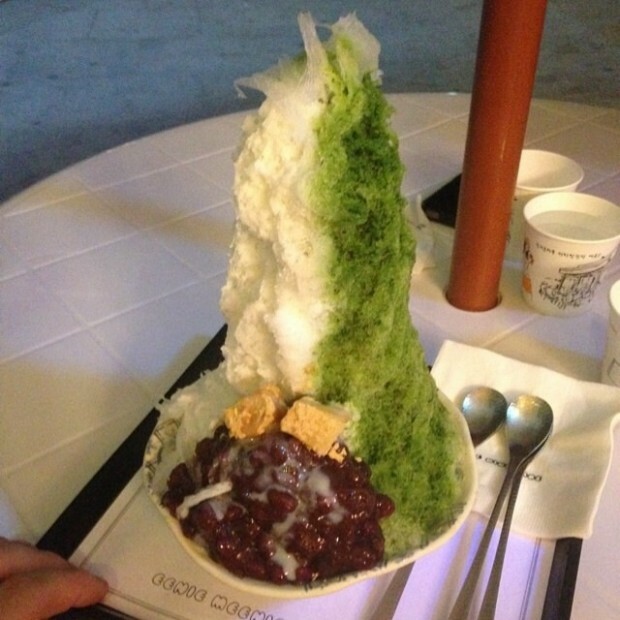 This was a perfect alternative for me and I didn’t even miss the cream! Who needs another photo of a bowl of soup anyways? I’ll just proceed with the good stuff, the recipe! Make it and let us know what think. Heat olive oil in skillet and add in celery, onions, mushrooms. Cook vegetables until soft. Next add in seasoning, except for the Brandy, hold off adding in the Brandy in until the end. Next add beef broth and simmer for 5 minutes. Remove the soup from heat and pour into a blender and puree. Once smooth, pour the puree back into the skillet or a pot and add 2-3 cups water and bring back to simmer. Lastly add in brandy and simmer for 5 minutes. ENJOY! I came across this recipe awhile back when flipping through a magazine subscription that my grandma got me last Christmas, Country Living. I clipped it out and thought it would be perfect for someday down the road. I don’t know about you, but I clip and favorite so many recipes with high hopes to try someday, but often someday doesn’t come for years. So when I do finally dust off the clipped or favorited recipe I am ecstatic that I finally reached someday! 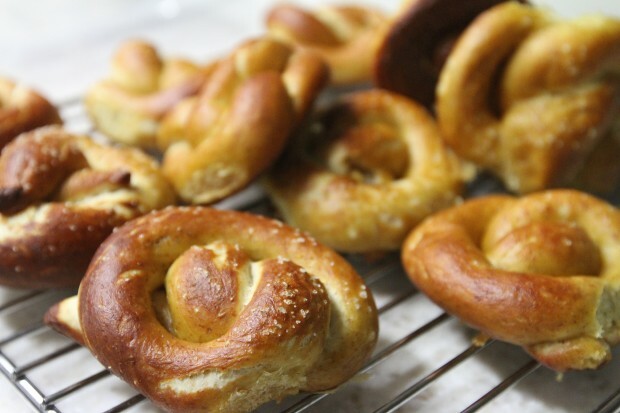 The pretzel recipe might look like it’s intimidating but really it’s not. The only real tedious part, well if you can even call it tedious, is waiting for the dough to rise. I always do a happy dance when my dough rises as it should for recipes. There is nothing worst than waiting an hour or two on dough only to find out that something went terribly wrong with the yeast. I know all of you bakers out there can relate with that statement. These aren’t Annie Ann pretzels but they certainly do suffice the Mister’s cravings. 24 pretzels for two people…can I interest anyone in a late night pretzel? In a medium bowl, combine 1 tablespoon honey, yeast, and 2 1/4 cups warm water (100 degrees F), and stir until yeast dissolves; let sit until foamy, about 5 minutes. Meanwhile, in a large bowl, combine flours and fine salt. Using a wooden spoon, stir in the oil, yeast mixture, and remaining honey until a shaggy dough forms. Sprinkle 1/2 cup flour on your work surface; then transfer dough to surface and knead, adding up to 1/2 cup more flour as needed, until dough becomes supple and elastic. Coat a large, clean bowl with olive oil. Place the dough in the bowl, and cover with a towel. Let rise in a warm place until dough doubles in volume, about 1 hour. Line 2 baking pans with parchment and set aside. Punch dough down and knead for 5 minutes. Divide dough into twenty-four 1 1/2-ounce pieces (each slightly larger than a golf ball) and keep covered. Working with one piece at a time, roll dough into a 14-inch-long rope. Bring both ends together and twist twice near the top. Fold ends down so they sit atop the bottom loop of dough; press ends into loop to form a pretzel. Transfer to a prepared pan and repeat with remaining dough. Let pretzels rest for 15 minutes. Preheat oven to 400 degrees F. Meanwhile, in a medium pot, bring 6 cups water and baking soda to a rapid simmer. Working in batches, poach pretzels for about 15 seconds on each side. Return to prepared pans. Lightly beat egg whites with a pinch of fine salt. Then lightly brush pretzels with the egg-white mixture and sprinkle with coarse salt. Bake until pretzels are deep brown and cooked through, about 15 minutes. Transfer to a wire rack to cool completely. To make the mustard: Stir light-brown sugar and finely chopped rosemary into Dijon mustard. Barns and Nobles and Amazon describes The Silver Spoon as the most influential and bestselling Italian cookbook of the last 50 years. They also say that this is the bible of authentic Italian home cooking, featuring over 2,000 recipes, that is uniquely stylish and user-friendly, making it accessible and a pleasure to read. We Bee’s couldn’t agree more! When I first got my hands on The Silver Spoon in a favorite local cafe, I knew I had to have it. I remember sitting there across from Mr. B one evening carefully pouring over each beautifully illustrated page, imagining the amazing smells coming from our kitchen. Mmmm… After about 5 pages of Oh’s and Ah’s Mr. B was sold too. Hook line and sinker, we were caught! HA HA HA! I know you are dying to know what we’ve made so far, right? Of course! (ABOVE) Gardner’s Bag- Roasted fresh bell pepper stuffed with all sorts of delicious things such as, eggplant, garlic, basil leaves, mozzarella and capers. Mr. B was a bit frustrated with the bell peppers not keeping their form once they came out of the oven, but they tasted heavenly nonetheless. (ABOVE) Pork roulades with apricots- We made this for our dinner guest Kelsey one night. We were all really pleased with the flavors of the apricots mixed with the pork. (ABOVE) Roasted beef with carrots- Believe me when I say this dish was magical! It sounds all plain Jane and Sunday dinner-ish, but it’s so much more. Think beef wrapped in pancetta with sliced carmelized carrots all seasoned with a brandy, thyme, nutmeg and garlic glaze. Ooooh the stuff kitchen dreams are made of! Have you heard of the Silver Spoon Recipe book? Perhaps you have even tried a few recipes too? What are your favorites? We’d love to know! FFE= Fuss free and easy! Two items that we Bee’s look for in a recipe after a long day of work. We’ve been on a fish kick lately. I must confess, I have been loving every savory second of it too. Mr. B is getting quite creative with seasoning and such. I mean honestly, does anyone else out there not ever get sick of fish? Cod. Eh, cod doesn’t come across as a fancy pants fish, right? Wrong. Cod can delicious served simple or jazzed up with all sorts of fun ingredients. Tonight we jazzed up our cod by poaching and using ingredients such as sassy saffron and white wine. Add chopped fresh tomatoes, crushing with your wooden spoon as you add them, wine, bay leaves, saffron, and ½ cup water. Bring to a boil, reduce heat, and simmer until flavors meld and until tomato skins peel off while string gently. Season with salt and pepper. Did you know that dopamine levels rise in your brain when you try new foods? All the more reason to broaden your inner foodie horizons, right? Someone mentioned in passing that they missed out on seeing what we’ve been concocting in the Bees kitchen lately. Yes, I admit…there has been a teeny bit of neglect with blogging since getting back from Malaysia. To be fair, I blame summer and the evening walks we’re taking advantage of before monsoon season really settles in. Nevertheless I’ve been taking photos of the delicious foods and things we’ve been up to, just purely neglecting to go the extra mile to upload them and write a post. I know you’ll forgive. Boy do we have a treat to share from one of our favorite blogs. So let’s get on with it and kick off the very middle of this week the right way! Eat the “couscous” on its own, or it makes a very nice paring to some homemade breaded cod. Just curious, what do you think? Do you think you will try the recipe? What do you think you will pair the dish with? Stay tuned for some more delicious recipe ideas.